Today, in 2011, you have to look pretty hard to find evidence of the industrial past of the Upper Housatonic Valley. Yet where the upscale second (and third) homes, private schools, and artistic and cultural activities that characterize the area now stand was once a major "smokestack industry" area. Iron and limestone mines, more than 40 blast furnaces, mountains stripped bare of trees to make charcoal, foundries, and railroad yards took advantage of the co-location here of the key natural resources needed to make iron: high grade iron ore, limestone, forests to burn to make charcoal, and water power -- and then to fabricate such products as railroad wheels with the locally produced iron. If you have an interest in the development of the iron and steel industry in America, we offer a number of CD-ROMs that may interest you. You'll find links to material about each of them further along on this page. 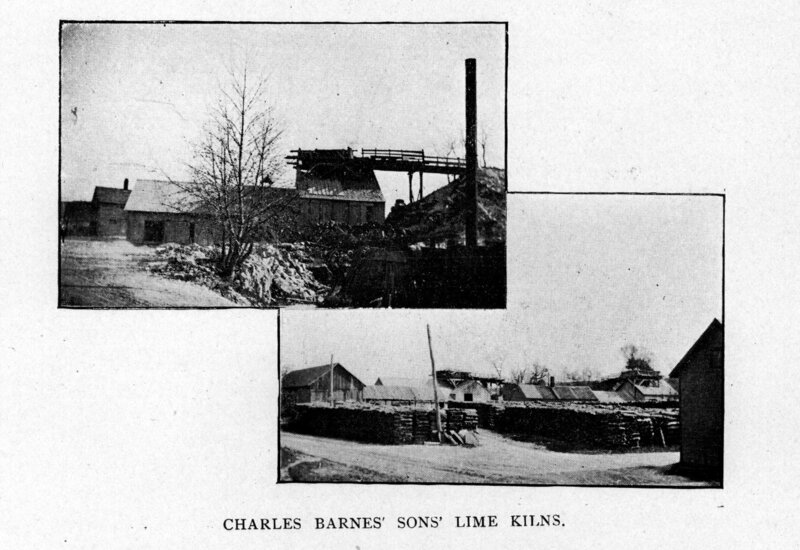 We offer in one download two of the earlier articles about the history of the iron industry in Connecticut, both by Charles Rufus Harte, one of the first people to recognize the historic importance of that industry. Included are (1) "The Early Iron Industry of Connecticut" by Keith and Harte, and (2) "Preserving a Typical Iron Furnace" by Harte. Available in PDF format, 80+ pages, for $3.50. People who live or vacation here today and enjoy the natural beauty yet yearn for the "good old days" probably should reconsider! For nearly 200 years, this area was a contender for the title of "Smokestack America." 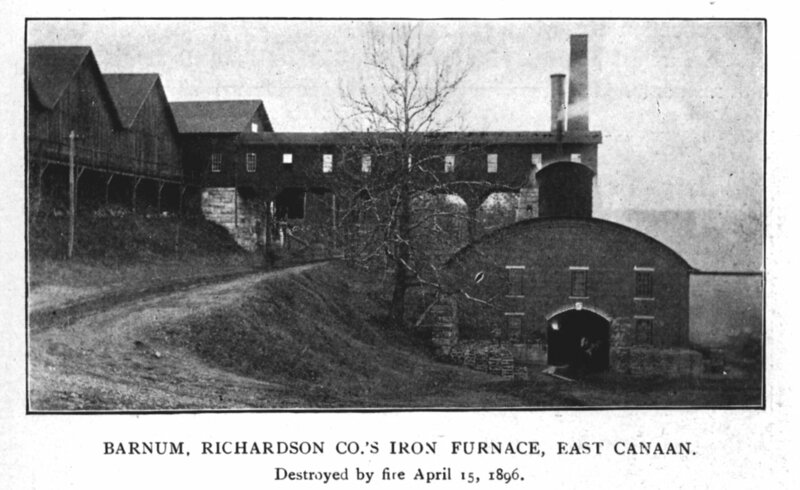 Between the continuous charcoal burning process on every mountain to create the charcoal needed for the blast furnaces and foundries, from smoke from the furnaces and foundries themselves, from the forges melting and casting the locally produced iron, and from the fabricating operations, a continuous pall of smoke must have hung over the area much of the time. The noise of industrial processes -- can you imagine what something called a "hammer mill" might sound like? -- was pervasive and continuous. Heavy industry sat cheek-by-jowl with residence and church, and even families like the Barnums and Richardsons, who owned major parts of the heavy industry here, lived within a short stroll of their forges and mills. Even though nature has since reclaimed our green hills and valleys, the Iron Heritage is still here. Increasingly, its national historic importance is being recognized. Our Congress even got around to recognizing this via our Upper Housatonic Valley National Heritage Area. Between the Lakes Group is participating in the process of finding our iron heritage and in making it more readily accessible to more people. The process is underway. For the most part, the loss of history has been more or less arrested, although threats to the portions that remains can be expected to continue and even increase as developers find attractive targets in our area. And there is much work still to be done before we will not only have saved the remaining structures, but also recaptured a complete picture of what life in this industrial area was really like. Below are some links to websites with more information about our area and its industrial past. New to the area? The Upper Housatonic Valley National Heritage Area group has a great map of the historic and cultural sites not only in Connecticut, but also in New York State and Massachusetts -- including those from the historic iron industry. to visit the website of the parent organization of the -- finally successful -- campaign to have the Upper Housatonic Valley designated a National Heritage Area. The title of this section is an acronym for "Upper Housatonic Valley National Heritage Area, Inc. That's a mouthful! However, their charter is equally large: "heightening appreciation of the region, preserving its natural and historic resources, improving the local economy and quality of life, controlling undesirable growth, and promoting the cleanup of the Housatonic River." to visit the section of the award-winning Trinity Church Lime Rock website devoted to its history. The page includes not only the history of that somewhat unusual Episcopal parish church -- the parish built by the Barnum and Richardson families, of Barnum Richardson Company (owners not only of eight area blast furnaces but much of the area iron fabricating capability as well), for themselves and for their workers -- as recounted by several authors, but of the Barnum family and of the Lime Rock community as well. 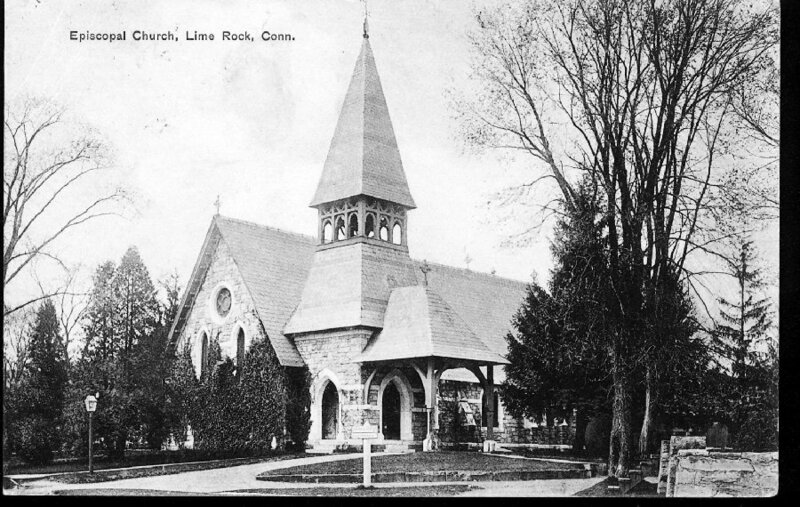 Since the village of Lime Rock was largely a "company town" at the time Trinity was established in 1872-73, it is likely that Trinity was perceived by its founders as a "company church" -- providing a convenient church for the management and welcoming the workers as well. Many entities -- corporate and otherwise -- made up the iron industry in our area. Trinity Church Lime Rock has the distinction of being the oldest one still remaining in existence in the same corporate form, under the same ownership, in the same building, still functioning, and (probably because the death of the iron industry deprived it of its main source of funds) still essentially unchanged since the turn of the 20th century. If you have an interest in the historic iron industry in other parts of the United States, let us recommend to you another CD-ROM from Between the Lakes Group called Johnstown: the Great Flood and Afterward. We also recommend a chapter on the economic geology and the history of iron, coal, and coke in Fayette County, PA that we publish as a download. Scrap Book of North Canaan can be classified as a rare book today. We have obtained a copy, scanned it, and added a full index, as well as some ephemera. The index is available on this website for your use. to learn more about Scrap Book of North Canaan -- including the new index -- and see additional material about Canaan, including views of Canaan today. If you already have access to a copy of Scrap Book of North Canaan, you'll appreciate this index. If you don't have a copy of "Scrap Book" -- you can order a scanned copy on CD-ROM. This CD-ROM also includes topographic maps drawn in the same decade when "Scrap Book" was published, scanned copies of two of the "Manuals" of the Pilgrim Church of North Canaan (this was the church of many of the Iron families), and some photographs of North Canaan and the surrounding area as it appeared in 2002-2003, including a "then and now" slide show. for ordering information. By the way, your purchases of this CD help us finance the web presence we provide for the Friends of Beckley Furnace. How much land speculation really occurred in colonial times in Salisbury, CT? The popular tradition had been that land speculation was positively rampant -- almost a "favorite indoor sport" of the time. In those days, of course, the Ore Hill mine was still a hill (today, it's a lake), and the stage was being set for Salisbury's later importance in the history of Iron in America. At some time in the future we anticipate publishing a previously unpublished Masters essay written in 1991 that examines Salisbury's early land records in detail and subjects them to rigorous analysis. Unlike most popular history, this one is filled not with theories, generalizations, and puffery about local ancestors, but instead with databases and spreadsheets. In the process, it raises significant questions about land speculation in Salisbury around the time of the birth of the historic iron industry. How much land speculation really DID happen? This article answers that question with finality. We expect to make it available shortly, but publication is currently delayed due to the author's health and her desire to amplify some of the conclusions drawn. Check back here for details. We anticipate offering it as a download. You may find some of the photos on our Canaan page of interest. Please to take a look. Likewise, our Lime Rock page has several views of that "company town." Railroads have historically followed the iron industry wherever it has developed. The Housatonic Valley was no exception. By December 1842, the Housatonic had been completed from Bridgeport in the south to the Massachusetts state line, and was completed all the way to Pittsfield by 1849. 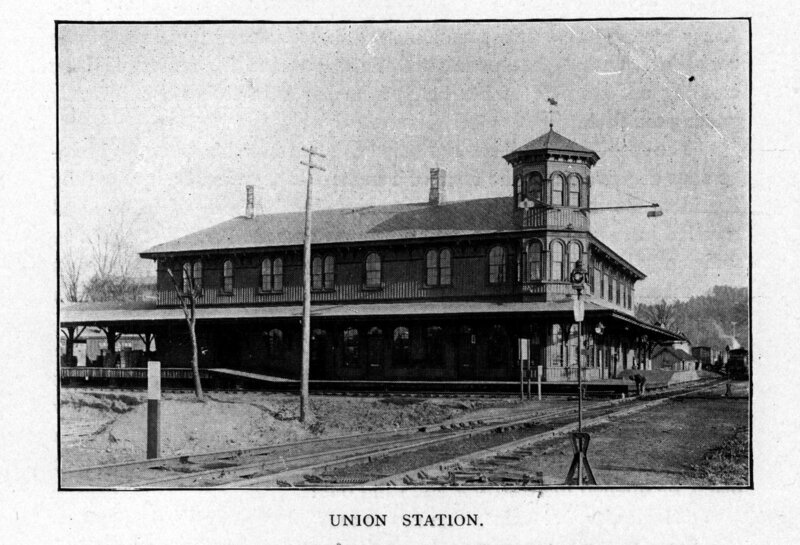 Not surprisingly, there was not arms-length independence between the iron industry and the Housatonic Railroad, as William H. Barnum, of the Barnum Richardson Company, and a founder of Trinity Church, "The Church that Iron Built," was also a trustee of the Housatonic Railroad and later its president. to visit a website with some great photos of the Housatonic Railroad as it appears today -- as well as some traces of its history that remain. Recommended!! The Tri-Corner History Council, which can be contacted c/o the Salisbury Association, 24 Main Street, Salisbury CT 06068, has prepared a new folder entitled "The Iron Industry in Connecticut's Northwest Corner". It includes a short summary of the industry and a map of a Heritage Trail covering the artifacts of the iron industry as they appear today. The folder is available through the Tri-Corner History Council, or through any of the area historical associations, as well as at local inns. "Ghost Towns" is the name of a website we're happy to recommend. They have made a specialty of just those throughout the US. In our case, of course, we're not just talking about ghost towns, but about a whole ghost INDUSTRY! The Ghost Towns website is definitely worth a look. to visit it! if you would like to see pictures from the Blackberry River Walk for 2003. On that walk we learned about the historic Iron industry from today's experts, including descendants of families who actually made the industry happen, in the actual locations where history (and iron) were made. SPECTACULAR! See the PICTURES! In case you think that learning about the historic iron industry is just for academics, retirees and tourists, you might be interested in knowing that Beckley Furnace often hosts groups from area high schools and junior high schools. Mt. Everett Junior High were two schools that visited Beckley recently and learned about the iron industry first hand. We've got pictures of the learning process. to visit the history pages from The Inn at White Hollow Farm. another local history CD-ROM from Between the Lakes Group. Here are a few selected Internet links to articles providing more information about the Iron Heritage of the Upper Housatonic valley. 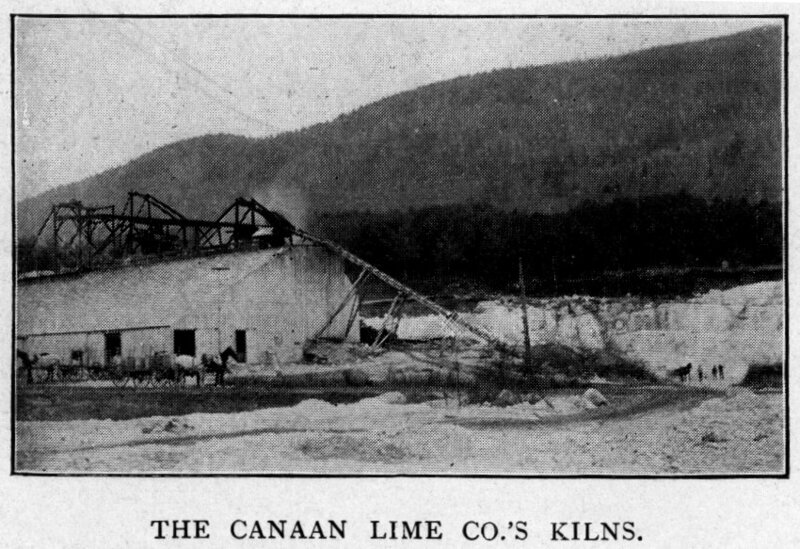 to read an article in "American Profile" by Ruth Epstein about Canaan, CT, and the Beckley Furnace. to see an abstract of the North Canaan section from "The Connecticut Guide" of 1935.
to read a narrative about an experiment at South Kent School in which they built a working (?) blast furnace in 1999 - 2000.
to read an article about the iron industry from the Sharon Historical Society. to learn more about the mineralogy of the Limonite ore of the Scoville Ore Deposit in Salisbury. NOTE: The five links immediately above connect to websites that are not under the control of Between the Lakes Group. The contents of those sites may change without notice, and the addresses may change, which can make the sites inaccessible. If you encounter any difficulties with any of the sites in the "Other Sources of Information" section, please to e-mail Between the Lakes Group and let us know what's wrong. Also, if you find other links to material about this subject, please let us know as well, and we'll consider adding them to this page. Thanks in advance!! Below are a few historic images reflecting aspects of the Iron Industry in the Upper Housatonic Valley. Click on any of the images to view larger versions. Sources: #1 - #4: Scrap Book of North Canaan. #5: archives of Trinity Church, Lime Rock, "The Church that Iron Built" For more information about Beckley Furnace, including chronology and maps and many more pictures, see below. For more information and photos from the archives of Trinity Church, Lime Rock, see the link above. : the historical society for the Towns of Canaan and North Canaan, does not yet have a web site of their own, so we hare pleased to provide some of their material here as a public service. Please to see it. Included is information about the Society, their current program, and how to join or support their worthwhile programs. If you want to learn about the iron industry in our area, the Friends of Beckley Furnace will not only help you learn, they will actively involve you in recovering the history of an industry and an entire area! as well as the 2003 Blackberry River Walk photos.